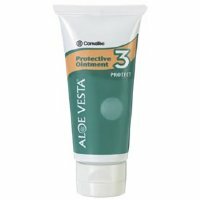 Aloe Vesta® Protective Ointment is an ideal barrier/ointment for routine use in incontinence care. It performs two key functions: moisturizing and protection of the skin. The petrolatum-based ointment is easy to apply. It provides an effective barrier that seals out moisture, contains protein-rich emollients to moisturize and is non-sensitive.